At Primo Pup Vet Health we get a lot of questions about maintaining a dogs coat (their hair or fur). The canine coat is a complex part of the animal’s body. It protects them, keeps them warm and is one of the most visible signs of the health of the animals. A soft, shiny well-groomed coat presents a dog that is well cared for and approachable. A lot goes into maintaining a good coat. It all starts with nutrition. Bathing at the proper intervals is important as well. Depending on the bread, haircuts may factor in two. However, the most routine coat care item is regular brushing. Why is brushing so important? For lots of reasons. Different breads have different types of hair. Many have two types even – a soft insulating undercoat and a protective top coat. Others, such as a poodle, have one single soft coat. Caring for the coat is equally important however. Brushing the coat keeps the fur from matting and tangling. Animal fur that is matted is very uncomfortable to the dog, can cause skin diseases and often must be physically groomed or shaved out. 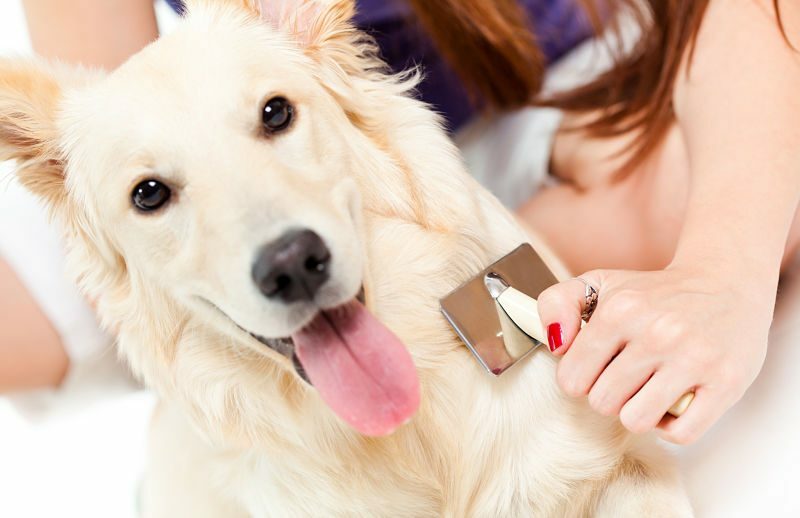 Brushing also removes hair that the dog has naturally shed, helping to keep their coat (and your home) cleaner and allowing them to better regulate their body temperature. Brushing stimulates the skin and helps to keep it and the hair healthy by distributing natural oils that nourish the hair and skin and help to waterproof the hair as well. Brushing the dogs coat isn’t as straightforward as a human head. Brush selection is crucial to ensuring a thorough grooming that gets at both the undercoat and overcoat while not daming the skin. Typically, a slicker brush is best. They have long, soft bristles and come in a variety of different lengths and firmness. Be sure to visit a good pet store or your veterinarian with your dog to select a brush. The frequency of brushing is dependent on the bread and environment – even how much natural light the dog is exposed to. Talk with your groomer or vet about the specific needs of your pet based on their hair and skin as well as where you live and the animal’s lifestyle.